A few dozen people casually board the Machigonne II and take a seat in the warm cabin to escape the icy wind cutting across Portland Harbor. 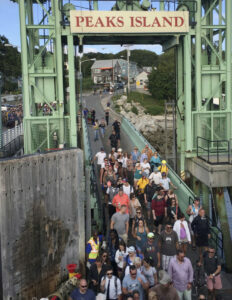 Roughly 15 minutes later, they file off the ferry onto the quiet streets of Peaks Island, a 1.2-square-mile Portland neighborhood of fewer than 1,000 winter residents. Come summer, however, the commute won’t be so simple and life won’t be so peaceful. The island’s resident population will triple and ferry ridership will more than quadruple. Islanders will compete for a spot on the ferry with day-trippers, wedding parties and vacationers. With no reservation system or orderly boarding process, it can become a scrum. Strollers and carts can become battering rams. Now, a plan to build a much larger modern ferry has islanders worried. The new boat means they will have an easier time getting home to the island. But so will summer visitors. From its earliest days, Peaks Island has been a popular destination, according to “A History of Peaks Island and its People,” published in 1897. The Peaks Island Steamboat Co. was formed in 1871 and began offering year-round service, expanding the summer-only ferry link that catered primarily to visitors. A deckhand walks from the Machigonne II’s pilothouse to its car deck to prepare for docking in Portland on a recent afternoon. 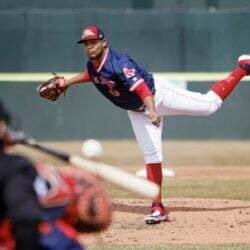 Author Nathan Goold said the 740-acre island, which had a year-round population of 343 people in 1896, was the most popular island in Casco Bay and one of the most beautiful. And it offered visitors a unique sense of freedom. At the end of the 19th century and start of the 20th, Peaks was known as the Coney Island of Maine. It had several hotels, a playhouse and dance hall. Visitors could also enjoy a boardwalk stroll, a carousel, bowling alley, Ferris wheel and hot air balloon rides. Goold correctly predicted that the island’s popularity was not a temporary infatuation. 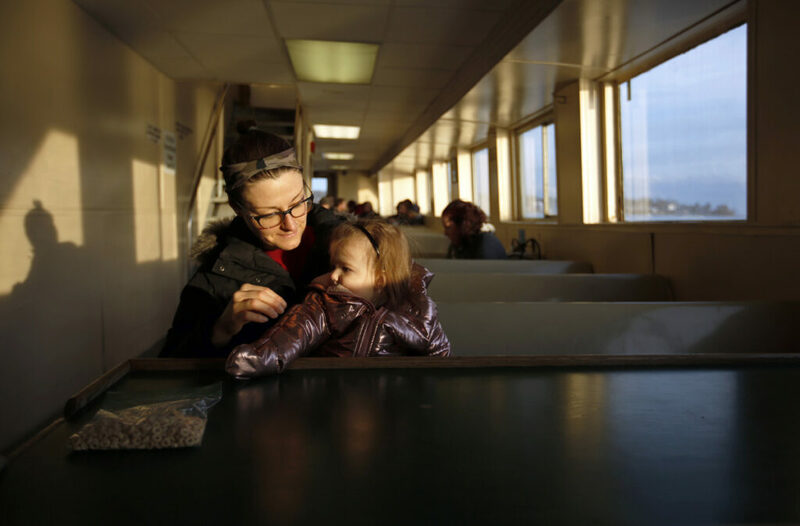 Peaks Islander Devon Kraft and her daughter Peri ride the ferry to Portland this month. Like many others, Kraft is wary of the changes a bigger vessel could bring. These days, Peaks Island also has a reputation of being fiercely independent. 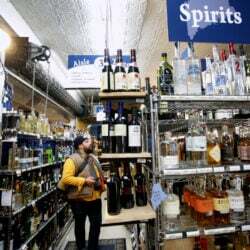 It has tried twice within the last two decades to secede from Portland amid disputes over taxation and local service. It continues to be a burgeoning tourist destination, even though there aren’t a lot of activities. There are a couple of restaurants and bars, an ice cream shop, a store, an abandoned fort and some beaches. There is one year-round public restroom, if you know where to find it, though the city has added a few temporary toilets during the summer. Many visitors simply walk about, ride their bikes, hole up at a bar or rent golf carts to explore the island before heading back to the mainland. The ferry ride itself – which costs $7.70 in summer – is part of the draw. In 2018, more than 784,000 people took the ferry to Peaks Island, according to ridership information provided by Casco Bay Lines. That’s a 10 percent increase over the roughly 712,800 people who took the ferry to Peaks in 2014. 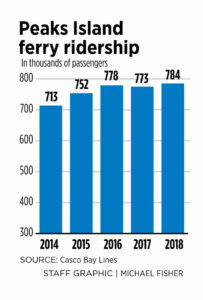 The Peaks ferry carried as few as 30,000 riders in one month last winter. Ridership exploded to nearly 139,000 people a month in July and August, when the boat makes 16 crossings a day. During one three-hour period on the Fourth of July, nearly 2,000 people rode the 399-passenger ferry. 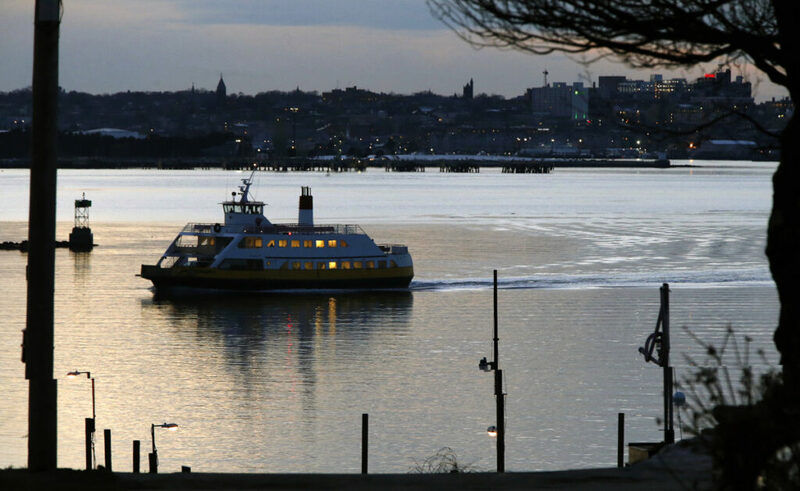 To help ease commuting pressure, Casco Bay Lines is finalizing plans to build a $10 million ferry capable of holding 200 additional passengers and four more vehicles. 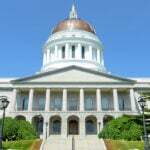 Eighty-five percent of the costs will be covered by federal funding, including a $6 million grant announced last year, according to Casco Bay Lines. Hank Berg, general manager of Casco Bay Lines, said it has the funding needed to build the new vessel and is finalizing the design of its propulsion system. Once that’s done, plans for the new ferry will be presented on Peaks Island, before facing a vote of the CBL board in the coming months. The new ferry should be in service by late 2021, he said. Berg said that even though the new ferry will be able to carry about 600 passengers, the board could still vote to set a lower capacity to help address concerns. 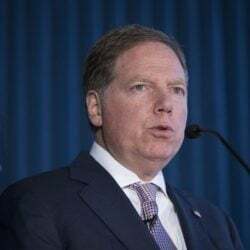 That was done when the current ferry was put into service in 1987, he said, although the board has since increased that capacity to the full 399 passengers. Island residents worry that a larger ferry will only lead to larger crowds and more vehicles on the island, which is about a mile long and 1.2 miles wide. 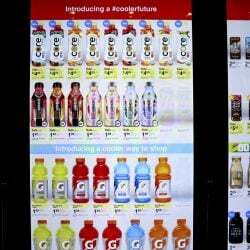 Residents worry the island lacks necessary infrastructure such as public restrooms and parking, as well as stores and restaurants to keep people entertained. Of about two dozen island residents interviewed for this article, the vast majority expressed either concern about or opposition to the larger ferry. Caron Chess, a 68-year-old retiree, said she’s concerned for public safety at the island terminal, where hundreds of people and a dozen or more vehicles wait to board the ferry, while the same number of people and cars are trying to get off. The situation worsens on Sundays during the summer, when hordes of mainlanders go to the island to listen to reggae music. Berg said that a larger ferry is needed to meet existing demand and shouldn’t lead to more people going to the island. In 2017, the Machigonne II reached its capacity of 399 passengers and 12 vehicles on 18 outbound trips and 47 inbound trips, Berg said. And it hit capacity more frequently last year – 23 outbound trips and 45 inbound trips. 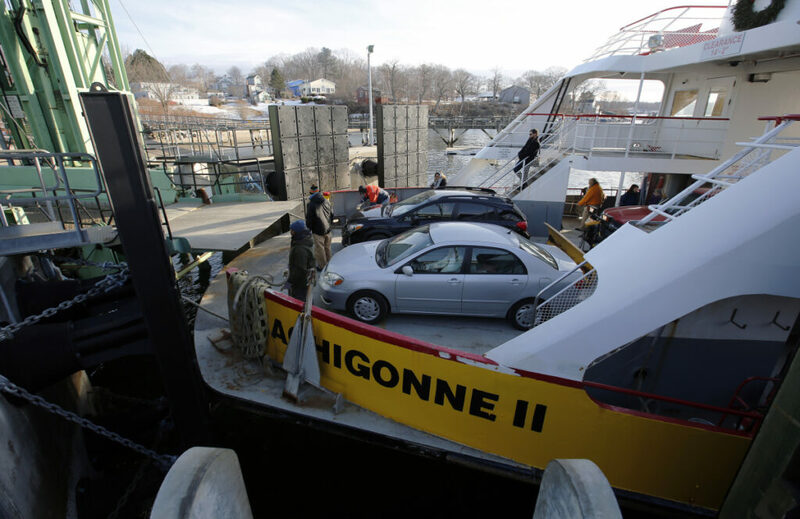 The Machigonne II lands at Peaks Island recently with cars to offload. Plans call for a larger ferry, which could carry 200 more passengers and four additional cars. Berg said a new ferry would carry as many as 599 passengers and 16 vehicles and would cut wait times and reduce the need to divert ferries from trips to other islands to help carry people from Peaks Island back to the mainland. He pushed back on the notion that a larger ferry would lead to larger crowds on the island. Some business owners and island residents do support the new ferry. 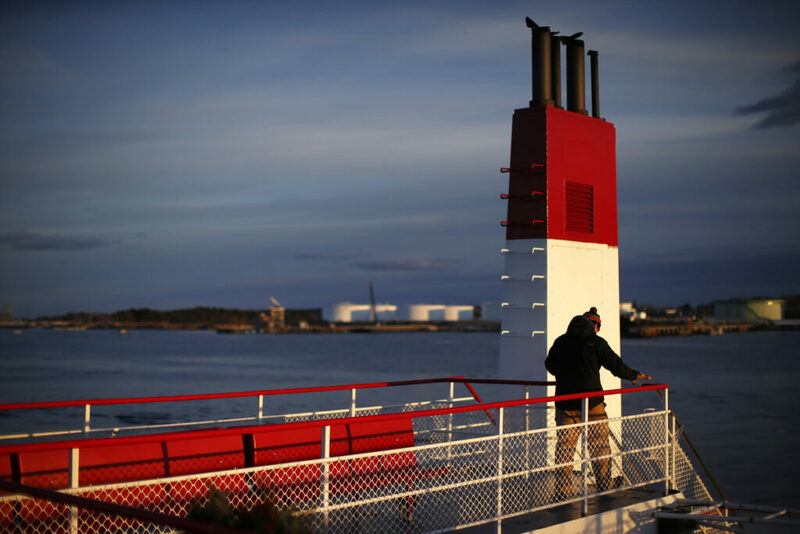 Frank Childs, a 74-year-old retiree whose family owns both a year-round and seasonal home on Peaks Island, said a larger ferry should make it easier for his family to attend church in Scarborough on Sundays. Bob Hannigan, owner of Hannigan’s Market, said that fears of the island being overrun with additional visitors are overblown. In addition to building a new ferry, Casco Bay Lines is seeking approvals to expand its terminal next to the Maine State Pier. The $7 million project is aimed at reducing congestion by extending the pier and adding a new boarding gate. Both vehicle and passenger circulation will be streamlined, according to plans filed at City Hall. The terminal was previously expanded in 2013. Islanders are concerned about a lack of public restrooms, not only near the terminal, but also on the backside of the island. Evident in this summer 2016 photo, ridership on the Casco Bay Lines’ ferry to Peaks rises to nearly 139,000 people a month in July and August, when the vessel makes 16 crossings each day. The only bathrooms open year-round are the ones at the community center, according to the city. The city invested roughly $40,000 last summer to install five, fully plumbed seasonal bathrooms near the terminal, said City Manager Jon Jennings. Jennings said he is trying to address other concerns raised by the islanders. He said $50,000 has been set aside in the city’s upcoming budget to reconfigure the island parking lot. The project could include moving the bike rack and adding more parking for golf carts, which are growing in popularity. Jennings said he’s also asked interim Police Chief Vern Malloch to look into whether additional policing is needed during the summer, especially during the popular Reggae Sunday at the Harborview at Jones Landing, a restaurant with a waterfront deck. He said summer police staffing currently consists of two officers and a cadet. Meanwhile, some islanders are frustrated with what they say is a lack of communication between Casco Bay Lines and the Peaks Island Council, which was established in 2007 following an unsuccessful secession effort. The council was created to give islanders more control. 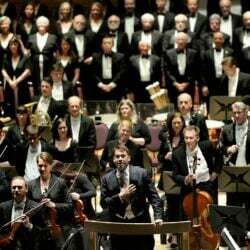 In recent years, it has received an annual budget of $40,000. Casco Bay Lines conducted a survey of island residents in late 2017 about the new ferry, but Berg, the bay lines manager, said the report has not been finalized, so it is not being shared with the public. Peaks Island Councilor Lisa Penalver said the council is drafting its own survey to solicit feedback from islanders. “We’re an amazing community and I’m worried about what this could all mean,” said Penalver, who was speaking for herself and not the island council, which has not taken a position. Island residents like Kathy Simmonds, a 54-year-old nurse practitioner, hope there’s a way to solve the transportation issue to Peaks without shutting the door on visitors. “I hope there’s room to continue welcoming people, but in a way that doesn’t lead to more congestion, which is an unpleasant thing to deal with,” Simmonds said.